1. Wash and clean pig maw. 2. Blanched in boiling hot water for 10 mins to remove smell. 4. Boil tap water into a large pot. 5. Add spices, garlics, dark soya sauce and pig maw. 6. Let it cook and simmer over low heat for 2 hours. 7. Check to see if water is running dry, just add more water. 9. Serve piping hot with fresh coriander leaves and dash of ground white pepper. picture is missing and how much for the spices? btw how much are it costs? Hi Gina, I can't seem to see the pic of the bak kut teh spices either, even though I waited to the page to fully load. 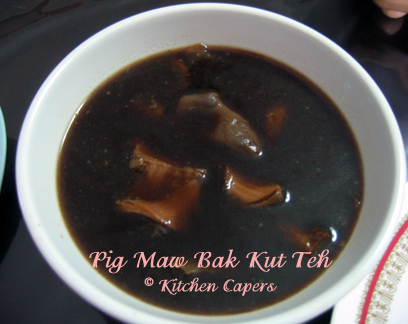 Also, am looking for a recipe to make the Hokkien version of bak kut teh - this is the one where the soup is dark and there is not too much pepper. I don't like the other Teochew version, which is the more popular version in Singapore, where the soup is light and lots of pepper is used. Do you have a recipe for the Hokkien version? Any spice packets you could recommend that would enable me to cook that version? you might want to try Pauline Loh's version. The soup is clear and doesn't have all the herbs in it. I think she had it printed in the Jan/Feb issue of Food n Travel magazine. That was the one I like..not too much herbs that kills the flavour of the pork bone marrow. As I know, peoples say pig maw or pig kidney must need to clean throughly or it may spoil the dish. Do you have sesame chicken and pig kidney recipe which served during hokkien confiment? Thanks.